For any first-time traveler to Russia Russian food is arguably one of the things to try on their travel to-do list. Russian cuisine will not leave you disappointed if you know the right places to go and here are our top ten choices to entice your taste buds. 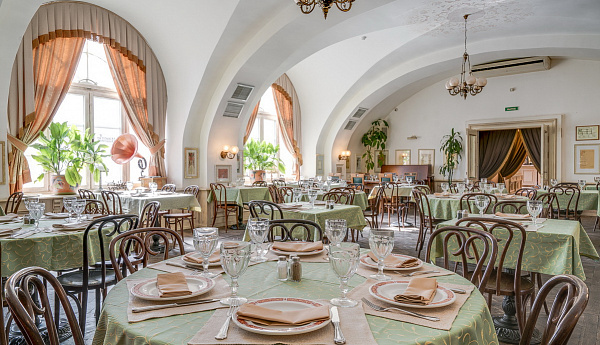 One of the most atmospheric restaurants of Russian cuisine, Pushkin Café is located in a Baroque mansion in the heart of Moscow on Tverskoy Boulevard. Everything, from the interior to the dishes has an aura of Russian nobility. Since the 18th century Tverskoy Boulevard was a favourite place among the Russian high society including Pushkin himself, and the restaurant is doing its best to keep this high-class charm around it. In the morning the restaurant offers an excellent breakfast menu where you can find such Russian classics as blini (crepes), caviar, cottage cheese with sour cream, homemade jam and honey as well as a plethora of egg dishes, dairy products and deserts. During the day the restaurant will treat you with a seemingly endless choice of salads, appetizers, soups, dumplings and more. Pushkin café was one of the first Russian restaurants to get into The World’s 50 Best Restaurants rating as well as the book Where Chefs Eat! A lot people familiar with Russian cuisine will tell you that pelmeni (a Russian take on dumplings) is a must-try when going to Russia. One of the best places to do it is Lepim-Varim (Shape and Boil). The café will treat the visitor with a wide variety of traditional Russian pelmeni fillings as well as funny names such as “The Famous Shrimp” (shrimp stuffing), “Uncle from Kamchatka” (Kamchatka crab stuffing), “Say cheese” (mozzarella, parmesan and gouda cheese stuffing). Another perk of the place is its great value – you can get a portion of Pelmeni for as little as £3! If you are looking for an adventure as well as dinner, Russian Fishing will not leave you disappointed. In 2014 The New York Times named it among the most unusual restaurants in the world. So, what is so unusual? The restaurant gives its visitors a chance to catch their dinner themselves! The staff of the restaurant will offer you the right fishing equipment and will teach you the basics of fishing if you have not tried it before. Then your catch will be prepared for you in the way you like. The restaurant also has an entertainment complex with a children’s room and a small zoo . It is a perfect discovery for fresh air enthusiasts and families. If you are fond of food markets and want to experience the country as a lot of local people do, we would recommend heading down to Dorogomilovsky food market. Mentioned for the first time around 1938, it is one of the main Russian food markets today popular not only with ordinary visitors but also with chefs of the best restaurants of the Russian capital! The market will treat you with an excellent choice of cheeses, sea food, fruit and vegetables and sweets! One of the specialties of the place is its fish section. If you are looking forsome fresh Russian caviar to bring home, Dorogomilovky market is the place to be. If you live in the UK and already familiar with Russian food, you have probably heard of MariVanna. The chain of Russian cuisine restaurants that belongs to GinzaProject who recently opened one MariVanna in London and one in New York. The restaurant is known for its cosy atmosphere. Every meal in here feels like a home-made meal at your babushka’s (grandmother’s) cooked with love and care. On the menu you will find classic Russian dishes such as Olivier salad and vinegret salad, pelmeni, vareniki, borsch and more. 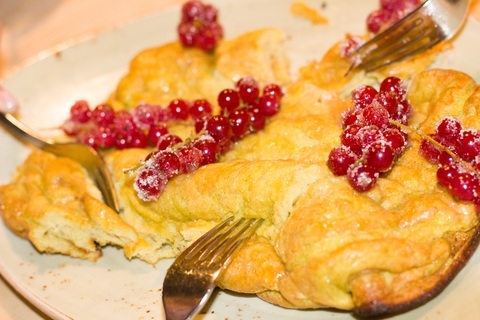 The restaurant also has a good choice of classic Russian treats like Ptichie Moloko cake or the famous Medovik. MariVanna is an excellent choice if you want to relax in a cosy atmosphere of a Russian home rather than a fashionable restaurant. Mu Mu is the sound that a cow makes in Russian language (moo-moo) and you will notice this funny theme in every corner of the restaurant. Outside you will be met by a big cow statue while inside all the plates are cow-themed and you will be treated with a traditional Korovka (Little cow) sweet made of cow milk at the end of the meal. Mu Mu is a buffet where you will be able to choose out of a variety of dishes lined in front of you. One of the main perks of the place is its generous portions and friendly prices. An ideal choice for a quick lunch before a busy day of sight-seeing. Rumochnaya # 1 (Vodkaroom # 1) boasts an atmosphere of the 19th-century Russia when vodkarooms were common places to eat or socialise. Even though the name implies a close connection with the famous Russian drink (which you can surely try in this restaurant) it is not the only thing available here. Rumochnaya’s menu is based on different historical periods of Russian historical development and, therefore, is a wonderful opportunity to explore Russia on a plate. Andrei Vlasov, the head chef of the restaurant, is known as one of the best Russian cuisine specialist in the country. Throughout his career he has managed to win a large number of national competitions and participated in numerous exhibitions.